Encryption is one of the major steps to be taken by every big technology giant in order to protect its users over the Internet, and, among those, Google has set an admirable example by gradually moving all of its online services to use strong HTTPS encryption. So far, Google encrypted email by switching its Gmail service to HTTPS, Google encrypted data communicating between its servers, Google gives priority to encrypted websites in its search results, as well as Google search also uses HTTPS. To help protect privacy and security of its users, the search engine giant is moving its advertising platforms to HTTPS, as well. Google has already moved its YouTube advertisements to HTTPS as of the end of last year, but Google has a widely spread ad network that serves ads to Hundreds of Millions of users across the Globe every day. ...Google will serve most of its advertisements over encrypted links by the end of June this year. "The vast majority of mobile, desktop computer, and video display ads served to the Google Display Network, DoubleClick and AdMob publishers will be encrypted [by June 30]," Google said in a blog post. 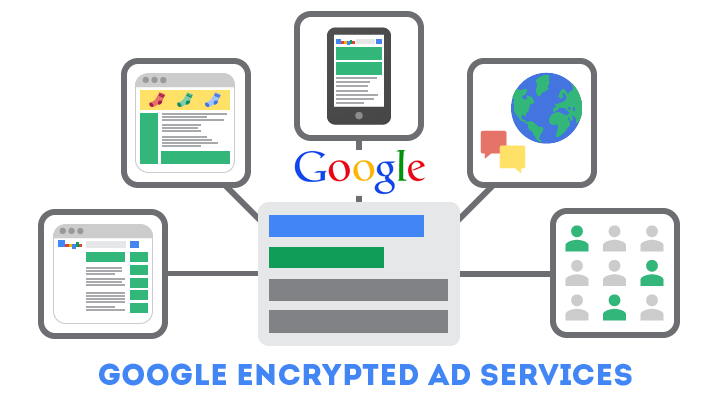 The advertisers using any of the buying platforms, such as AdWords or DoubleClick, will have an option to serve HTTPS-encrypted display advertisements to all HTTPS-enabled inventory, such as Gmail and YouTube. According to the company, the advertising industry could help make the Internet safer for all online users by encrypting ads. It also points to a recent post published by the Interactive Advertising Bureau (IAB), announcing that in 2015, the ad industry "needs to finish catching up" and adopt HTTPS. Though the company didn’t provide any deeper explanation about the use of encryption in the advertising platform, the move could be a part of Google’s efforts to encrypt everything under a wider "HTTPS Everywhere" initiative.